Happy Fourth everyone! We are spending the weekend with family- it's going to be crazy and fun. We had a BBQ last night with my family and I made these Red Velvet Cupcakes for dessert. I saw these Cupcakes in a Jar a few months ago and couldn't wait to try them out. We had to laugh because the women saw right away that they were cupcakes, just the trifle version. As for my Dad, I asked him if he wanted a regular cupcake or one of these, and he picked this, saying, "I don't want a cupcake, yuck." So we thought we could trick him into eating one of these if we didn't tell him what it was (you do that too, right?) It worked for a minute until he realized it was still a cupcake! 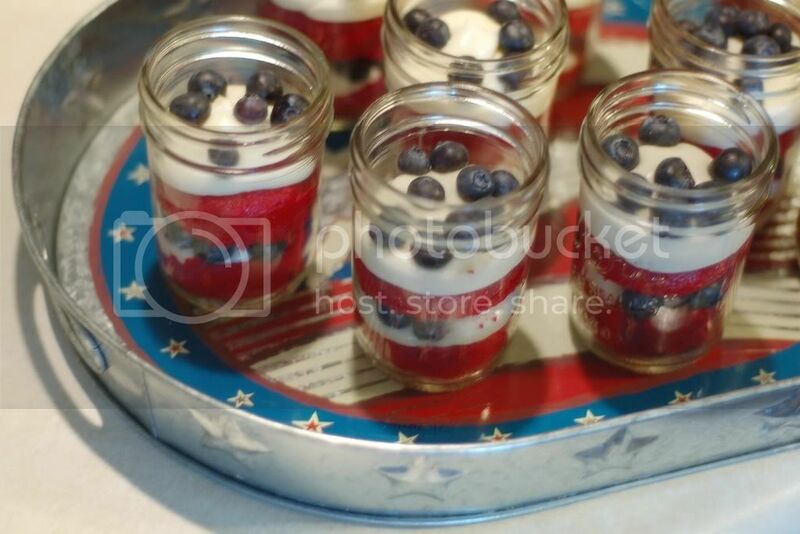 These were really cute, though, and simple to make. Just bake a cupcake without a liner and cut it in half after it cools. Layer up cupcakes, frosting, and topping until you like it. Because my tall man can't have chocolate, I made a "Lemon Velvet" cupcake. I know it's not at all true to form but it tasted great. Basically, I made my regular doctored cake mix red velvet style, but I used a lemon cake instead. I topped them with blueberries for color and because lemon blueberry is one of my favorite combos. A light, lemony cream cheese frosting on top sealed the deal. Give these a try next time you want to serve cake. Even if the guys didn't care, the presentation really went well with the women! Happy fourth of July- be safe and enjoy it! These are so cute! 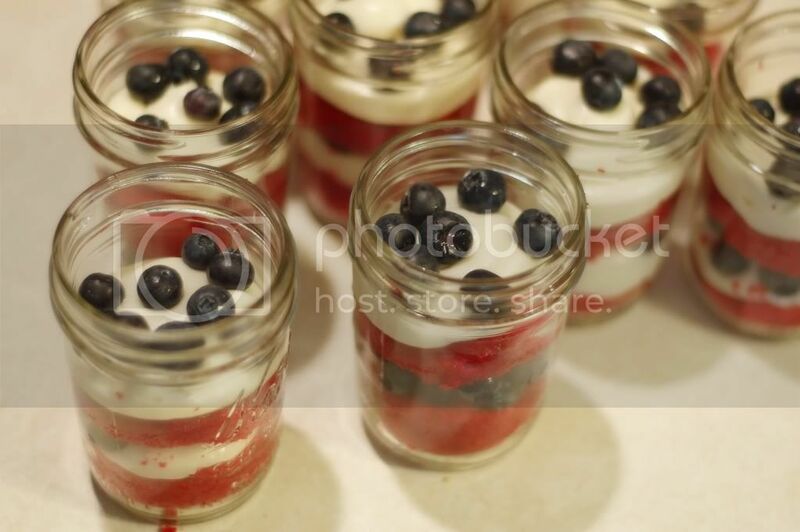 They're like mini trifles in a stylishly rustic, yet simple container. Love it! This is adorable! I love your blog-your recipes always look delicious and you have great presentation. I put a link to this recipe on my cooking blog as well! I love this idea! I am so going to do this one. 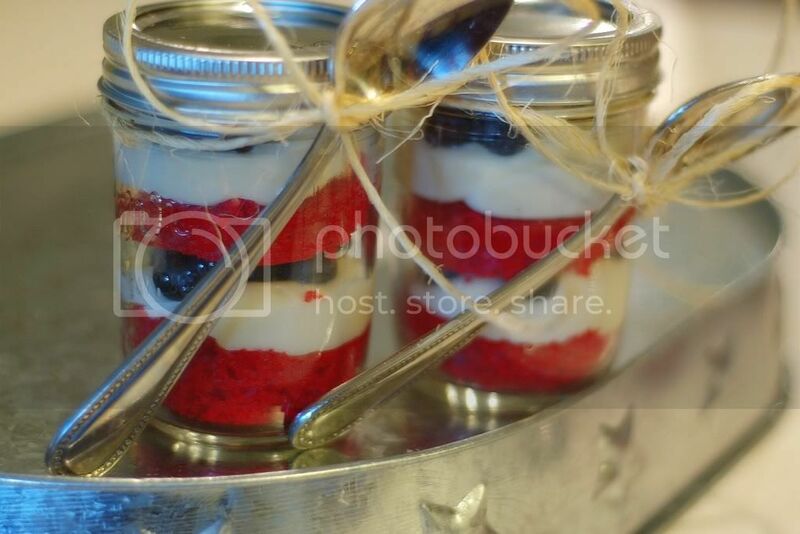 I LOVE, love, LOVE these cupcakes in a jar!!! These are too cute! I need to make these! THOSE SHOULD BE ON THE COVER OF A MAGAZINE ! Sounds like everyone had a great time. I love to play tricks on people like that! Love these cupcakes in a jar. I've never seen them but they look easy and delicious. Thanks for sharing with us. ok this is just about the cutest thing i've ever seen! I can't get over this cuteness. These are sooo cute, I want to try this! So cute! i think I am going to make some similar ones for birthday gifts! Cute and sweet! This is one of the cutest things I've ever seen!!! I want to try these out...Love em!